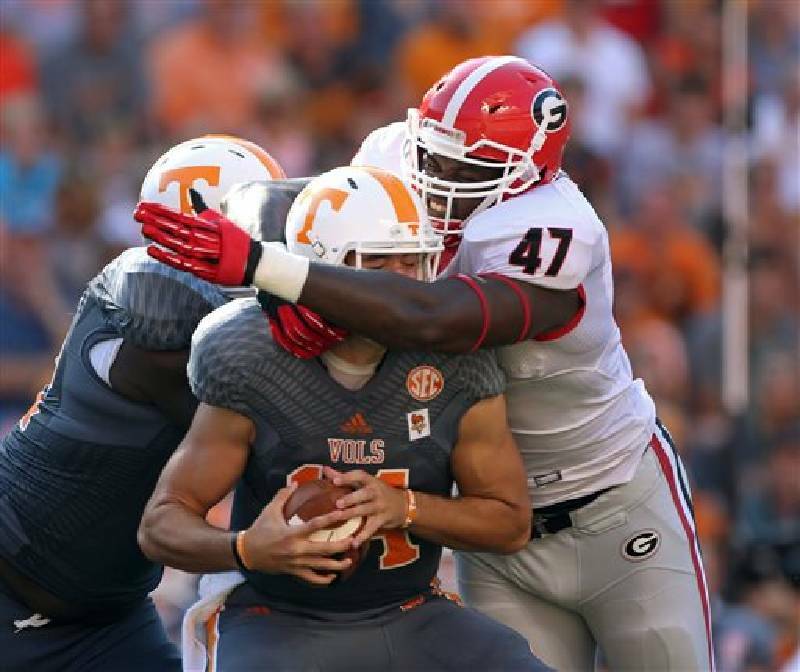 Georgia's Ray Drew, 47, sacks Tennessee quarterback Justin Worley, 14, during the first half of an NCAA college football game in Knoxville. University of Tennessee's head coach Butch Jones slaps hands to greets fans during the Vol's Walk before his Volunteers play the University of Georgia Bulldogs early Saturday afternoon at Neyland Stadium. KNOXVILLE - Marshall Morgan kicked a 42-yard field goal in overtime after No. 6 Georgia scored a tying touchdown with 5 seconds left in regulation as the Bulldogs overcame numerous injuries and beat Tennessee 34-31 on Saturday. Georgia (4-1, 3-0 SEC) forced overtime on Aaron Murray's 2-yard touchdown pass to Rantavious Wooten to make it 31-all. Rajion Neal's 7-yard run had put Tennessee (3-3, 0-2) ahead 31-24 with 1:54 left after Justin Worley found A.J. Branisel for a 28-yard completion on fourth-and-1 from the Georgia 35. Murray went 19 of 35 for 196 yards with three touchdowns and became the Southeastern Conference's all-time leader in career yards passing. Murray has thrown for 11,625 yards to break the record held by David Greene, who threw for 11,528 yards for Georgia from 2001-04. Neal ran for 148 yards and two touchdowns for Tennessee (3-3, 0-2), which has lost 19 straight games against Top 25 teams. This game was expected to start an easier stretch for the Bulldogs, whose first four games included a loss to No. 4 Clemson and victories over No. 13 South Carolina and No. 10 LSU. All three of those teams were ranked in the top 10 at the time they faced Georgia. But a flurry of injuries and a stubborn Tennessee team nearly ended Georgia's national title hopes. Georgia running back Keith Marshall injured his right knee after taking a hit from Tennessee's Cam Sutton while reaching for an incomplete pass in the first quarter and was carted into the locker room. Wide receivers Michael Bennett and Justin Scott-Wesley and punter Colin Barber were knocked out of the game later. Georgia played the entire game without injured star running back Todd Gurley and safeties Tray Matthews and Connor Norman. But after a 39-yard field-goal attempt by Morgan bounced off the left upright early in the third quarter, Tennessee rallied to tie the game. Tennessee had worn "Smokey gray" alternate uniforms Saturday in hopes of ending their history of frustration against ranked teams. The Vols hadn't used alternate uniforms since wearing black jerseys to a 31-13 victory over No. 21 South Carolina, their last win over a Top 25 team. And Morgan's miss had the Vols believing they could pull off the upset. Tennessee cut the lead to 17-10 on freshman Marquez North's diving 19-yard catch in the left corner of the end zone. The Vols scored the tying touchdown with 1:25 left in the third quarter when freshman Jalen Reeves-Maybin blocked a punt that freshman walk-on Devaun Swafford returned 15 yards. Georgia regained the lead when Murray's career-long, 57-yard keeper led to Brennan Douglas' 3-yard touchdown run around the left end on the first play of the fourth quarter. Tennessee answered on a 1-yard burst by Neal, who had kept the drive alive with a 43-yard run on a fourth-and-1 play.